Humanity Star: shinny star-ball, or light pollution menace? Credit: Humanity Star. It’s a question I’ve gotten lots, now that the calendar has flipped over from February to March. When will we get our first good look at the Humanity Star reflector satellite? The Humanity Star satellite was a surprise payload object placed on the January 21st, 2018 inaugural orbital launch for Rocket Lab’s Electron rocket. Said launch occurred at Rocket Lab’s Launch Complex-1 on the Mahia Peninsula in New Zealand, placing Humanity Star in a 92 minute orbit inclined 83 degrees to the equator. Launch! Electron’s inaugural flight. Credit: Rocket Lab. It makes sense to put a low priority payload such as a shinny orbiting ball or a Tesla roadster on an inaugural rocket launch. Anything can happen the first time ’round, and you wouldn’t want to say, bet the success of the James Webb Space Telescope on an untested launch platform. And since placing Humanity Star in orbit was a secondary objective for Electron, the orbit is a tough one to observe. It’s just now becoming visible around middle latitudes this week over the swath of the planet inhabited by most of well, humanity. Heavens-Above’s main page has a link dedicated to Humanity Star. Early magnitude estimates place its maximum brightness on a good overhead pass at around magnitude +1—visible to the naked eye, but hardly the “Brightest Object in the Heavens!” proclaimed on many websites. The Friday, March 9th pass of Humanity Star up the U.S. East Coast at 7:13 PM EST. Credit: Orbitron. And what goes up, must come back down. Very early predictions by the U.S. Joint Space Operations Command’s Space-Track website place the reentry for Humanity Star at sometime around March 25th. We’ll be watching for Humanity Star from our current base camp of operations in Norfolk, Virginia this week, clear skies willing. Follow us on Twitter (we’re @Astroguyz) for updates on sightings, magnitude etc. There’s no word yet as to when the next Electron rocket launch from New Zealand by Rocket Lab will take place. Is it good to put shinny junk in space? Another recent effort, the Russian Mayak reflector satellite from 2017, proved to be underwhelming. The first constellation of Iridium satellites will reenter over the next few years, marking the end of the Iridium Flare Era. One Japanese company even wants to provide customized artificial meteor showers. It reminds me of the good old/bad old days of the 1970s, when plans were afoot to place everything in orbit, from large reflectors to abolish the night (!) to orbiting advertising. And while our astrophotos aren’t getting photo-bombed by Pepsi or McDonald’s logos (yet), we can all chase down the latest attempt to get folks to look up this weekend. China’s first space station, Tiangong-1, is expected to fall to Earth sometime in late 2017. We’ve known for several months that the orbital demise of the 8-metric ton space station was only a matter of time. But Chinese space agency officials recently confirmed that they have lost telemetry with the space station and can no longer control its orbit. This means its re-entry through Earth’s atmosphere will be uncontrolled. Despite sensational headlines this past week (and earlier this year) about Tiangong-1 exploding and raining down molten metal, the risk is quite low that people on Earth will be in danger. Any remaining debris that doesn’t burn up in the atmosphere has a high chance of falling into an ocean, since two-thirds of Earth’s surface is covered by water. While NASA and other space agencies say it’s very hard to compute the overall risk to any individual, it’s been estimated that the odds that you, personally, will be hit by a specific piece of debris are about 1 in several trillion. But numerically, the chance that one person anywhere in the world might be struck by a any piece of space debris comes out to a chance of 1-in-3,200, said Nick Johnson, chief scientist with NASA’s Orbital Debris during a media teleconference in 2011 when the 6-ton UARS satellite was about to make an uncontrolled reentry. Johnson also reminded everyone that throughout the entire history of the space age, there have been no reports of anybody in the world being injured or struck by any re-entering debris. Something of this size re-enters the atmosphere every few years, and many are uncontrolled entries. For example, there were the UARS and ROSAT satellites in 2011, GOCE in 2013 and Kosmos 1315 in 2015. All of those re-entered without incident, with some returning so remotely there was no visual evidence of their fall. Wu Ping, deputy director of China’s Manned Space Engineering (CMSE) office, said at a press conference before the launch of the Tiangong-2 space station last week (September 15, 2016) that based on their calculations and analysis, most parts of the space lab will burn up during its fall through the atmosphere. She added that China has always highly valued the management of space debris, and will continue to monitor Tiangong-1, and will release a forecast of its falling and report it internationally. Tiangong-1 as seen in a a composite of three separate exposures taken on May 25, 2013. Credit and copyright: David Murr. So, all that can be done now is to monitor its position over time to be able to predict when and where it might come down. Without telemetry, how can we monitor its orbital position? “Although Tiangong-1 is no longer functioning, keeping track of where it is not a problem,” said Chris Peat, who developed and maintains Heavens-Above.com, a site that provides orbital information to help people observe and track satellites orbiting the Earth. Peat says they check for new data every 4 hours, and Space-Track updates the orbits of most large objects about once per day. Since Tiangong-1 is such a large object, Peat said there is no chance that it will be lost by Space-Track before re-entry. Additionally, amateur/hobby observers also make observations of the position of some satellites and calculate their own orbits for them. This is mostly done for classified satellites for which Space-Track does not publish data, and is not really necessary in the case of Tiangong-1, Peat said. But with uncertainties of when and where this 8-ton (7.3 metric tons) vehicle will come back to Earth, you can bet that the amateur observing community will keep an eye on it. First image of a solar transit of Tiangong-1, the first module of the Chinese space station, taken from Southern France on May 11th 2012. Credit: Thierry Legault. Used by permission. If you want to watch for it yourself, Heavens-Above provides tracking information anywhere around the world. Just input your specific location and click on “Tiangong-1,” listed under “Satellites.” Heavens-Above (they also have an app) is great for being able to see satellites like the International Space Station and Hubble, as well as seeing astronomical objects like planets and asteroids. Heavens-Above also has an interactive sky chart. Additionally, Marco Di Lorenzo on the Alive Universe website is monitoring Tiangong-1’s orbit, showing the orbital decay over time. He will be updating its status up through re-entry. But despite being able to track Tiangong-1, as well as knowing its location and orbit is not the same as being able to say exactly when and where it will fall to Earth. Jonathan McDowell, an astrophysicist at the Harvard-Smithsonian Center for Astrophysics who also monitors objects in orbit, said via Twitter that Tiangong-1’s reentry could be anywhere between the latitudes of 43 degrees North and 43 degrees South, which is a rather large area on our planet and are the latitudes where a majority of Earth’s population resides. That’s not especially comforting, but remember, the odds are in your favor. This plot shows the orbital height of the Chinese space station Tiangong-1 over the last year. It’s orbit was boosted in mid-December 2015. Credit: Chris Peat/Heavens-Above.com. Peat now has a page on Heavens-Above showing the orbital height of Tiangong-1 and you can see how the height is reducing as a function of time. It shows there was an orbital boost in December 2015. Tiangong-1 was launched in September 2011 and ended its functional life in March this year, when it had “comprehensively fulfilled its historical mission,” Chinese officials said. It was operational for four and a half years, which is two and a half years longer than its designed life. It was visited by the un-crewed Shenzhou-8 in 2011, and the crewed missions of Shenzhou-9 in 2012 and Shenzhou-10 in 2013. It also was used for Earth observation and studying the space environment, according to CMSE. If you happen to capture an image of Tiangong-1, please add it to Universe Today’s Flickr pool page. It’s a question we get all the time. Watch the sky closely in the dawn or dusk hours, and you’ll likely see a moving “star” or two sliding by. These are satellites, or “artificial moons” placed in low Earth orbit. These shine via reflected sunlight as they pass hundreds of kilometres overhead. Welcome to the wonderful and highly addictive world of satellite tracking. Ground observers have been watching the skies since Sputnik 1 and the first satellite launch in October 1957. Armies of dedicated volunteers even participated in tracking the early launches of the Space Age with Operation Moonwatch. Depiction of the apparent motion of a typical satellite overhead with respect to the observer. (Graphic created by author). The Internet has offered a wealth of information for satellite hunters. Every time I write about “how to spot the ISS,” someone amazes me with yet another new tracker App that I hadn’t heard of. One of my favorites is still Heavens-Above. It’s strange to think that we’ve been visiting this outstanding website daily for a decade and a half now. Heavens-Above specializes in satellites, and will show you a quick listing of passes for brighter satellites once configured with your location. A nifty “quick check” for possibly resolving a mystery satellite is their link for “Daily Predictions for brighter satellites” Which will generate a list of visible passes by time. 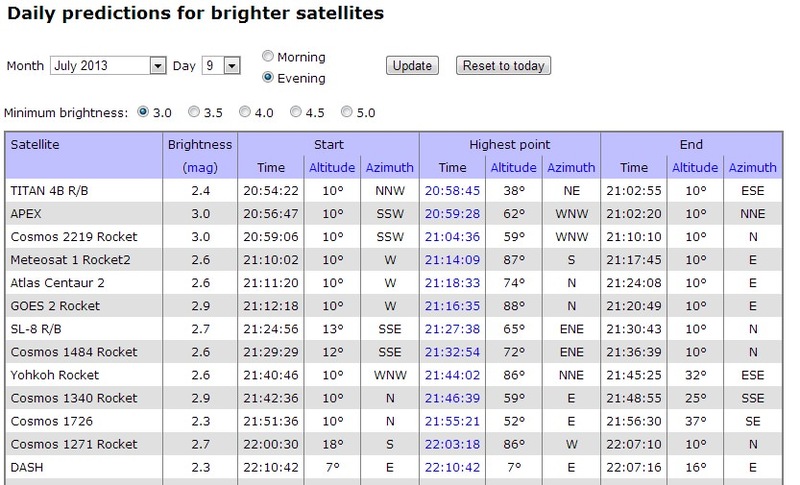 Screenshot of a typical list of bright satellite passes from Heavens-Above filtered by brightness, time and location . Looking at the time, direction, and brightness of a pass is crucial to satellite identification. No equipment is needed to start the hunt for satellites tonight, just a working set of eyes and information. We sometimes use a set of Canon image-stabilized 15x 45 binoculars to hunt for satellites too faint to see with the naked eye. We’ve seen the “Tool Bag” lost during an ISS EVA a few years back, as well as such “living relics” of the early Space Age as Canada’s first satellite Alloutte-1, and the Vanguards (Yes, they’re STILL up there!) using binocs. A comparison of typical satellite orbits. (Credit: Cmglee, Geo Swan graphic under a Creative Commons Attribution -Share Alike 3.0 unported license). The trick to catching fainter satellites such as these is to “ambush” them. You’ll need to note the precise time that the selected satellite is going to pass near a bright star. Clicking on a selected satellite pass in Heavens-Above will give you a local sky chart with a time-marked path. I use a short wave portable AM radio tuned to WWV out of Fort Collins, Colorado for an accurate audible time signal. Just sit back, listen to the radio call out the time, and watch for the satellite to pass through the field of view near the target star. Another great site for more advanced trackers is CALSky. Like Heavens-Above, CALSky will give you a customized list for satellite passes over your location. One cool extra feature on CALSky is the ability to set alerts for passes of the ISS near bright planets or transiting the Sun or Moon. These are difficult events to capture, but worth it! The International Space Station transiting the Moon as captured by Mike Weasner from Cassiopeia Observatory in Arizona. A great deal of what’s up there is space junk in the form of discarded hardware. Many satellites are on looping elliptical orbits, only visible to the naked eye when they are near perigee. Many satellites are located out at geosynchronous or geostationary orbits 35,786 kilometres distant and are invisible to the naked eye all together. These will often show up as streaks in astrophotos. An area notorious for geosynchronous satellites exists near the direction of M42 or Orion Nebula. During certain times of year, satellites can be seen nearby, nodding slowly north to south and back again. Around the March and September equinox seasons, geostationary satellites can be eclipsed by the shadow of the Earth. This can also cause communications difficulties, as many geo-sats also lie sunward as seen from the Earth around these times of year. Probably one of the simplest satellite trackers for casual users is Space Weather’s Satellite Flybys page. North American users simply need to enter a postal code (worldwide users can track satellites via entering “country-state-city”) and a list of passes for your location is generated. It’s a basic truism of satellite tracking that “aircraft blink; satellites don’t”. Know, we’re going to present an exception to this rule. Some satellites will flash rhythmically due to a tumbling motion. This can be pretty dramatic to see. What you’re seeing is an expended booster, a cylinder tumbling due to atmospheric drag end-over-end. Some satellites can flash or flare briefly due to sunlight glinting off of reflective surfaces just right. Hubble, the ISS and the late NanoSail D2 can flare if conditions are just right. The most dramatic of these are Iridium flares. The Iridium constellation consists of 66 active satellites used for satellite phone coverage in low-Earth orbit. 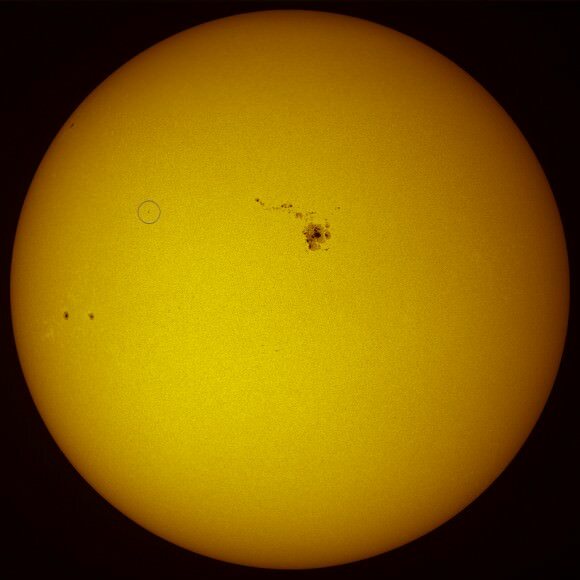 When one of their three refrigerator-sized antennas catch the Sun just right, they can flare up to magnitude -8, or 40 times brighter than Venus. CALSky and Heavens-Above will also predict these events for your location. Didn’t see a predicted satellite pass? Light pollution or bright twilight skies might be to blame. Keep in mind, passes lower to the horizon also fall prey to atmospheric extinction, as you’re looking through a thicker layer of the air than straight overhead. Some satellites such as the ISS or the USAF’s X-37B spy space plane even periodically boost or modify their orbits, throwing online prediction platforms off for a time. More advanced satellite trackers will want to check out Celestrak and SAT-Flare Tracker 3D. A screenshot example of TLE’s for the ISS & Tiangong-1 from Celestrak. I use a free tracking platform created by Sebastian Stoff known as Orbitron. Orbitron lets you set your observing location and tailor your view for what’s currently over head. You can run simulations and even filter for “visual only” passes, another plus. I also like Orbitron’s ability to run as a stand-alone system in the field, sans Internet connection. Just remember, for it to work properly, you’ll need to periodically update the .txt file containing the Two-Line Element (TLE) sets. TLE’s are data element sets that describe the orbital elements of a satellite. Cut and paste TLEs are available from Heavens-Above and Celestrak. Orbitron screenshot for visible satellites using ‘radar’ mode… there’s lots up there! (Credit: Orbitron). For serious users, NORAD’s Space-Track is the best site for up-to-date TLEs. Space-Track requires a login and user agreement to access, but is available to satellite spotters and educators as a valuable resource. Space-Track also hosts a table of upcoming reentries, as does the Aerospace Corporation’s Center for Orbital & Reentry Debris Studies. The SeeSat-L mailing list is also an excellent source of discussion among satellite trackers worldwide. Increasingly, this discussion is also moving over to Twitter, which is ideal for following swiftly evolving action in orbit. @Twisst, created by Jaap Meijers,will even Tweet you prior to an ISS pass! A NOSS pair captured by the author. The multi-colored trail to the left of the path is an aircraft. Note a bit of “jitter” at the beginning of the exposure- I had to swing the camera into action quickly! A CALIPSO LiDAR pass imaged by Gregg Hendry in 2008. My Hendry mentions that, “The hollow nature of the spots is likely due to some spherical aberration in the camera lens coupled with imperfect focus, and is not representative of the laser beam’s optical quality.” (Credit: Gregg Hendry, used with permission). NASA even publishes a prediction table for CALIPSO lidar passes. I wonder how many UFO sightings CALIPSO has generated? Artist’s depiction of the A-Train constellation of Earth-Observing satellites. (Credit: NASA). And speaking of photography, it’s easy to catch a bright pass such as the ISS on camera. Shooting a satellite pass with a wide field is similar to shooting star trails; just leave the shutter open for 10-60 seconds with a tripod mounted camera. Modern DSLRs allow you to do several test exposures prior to the pass, to get the ISO, f/stop, and shutter speed calibrated to local sky conditions. And that’s a brief overview of the exciting world of sat-spotting… let us know of your tales of triumph and tragedy as you sleuth out what’s going on overhead!